See the architecture page for an architectural overview of the different components of Watcher and how they fit together. In this guide we’re going to take you through the fundamentals of using Watcher. This guide assumes you have a working installation of Watcher. If you get “watcher: command not found” you may have to verify your installation. Please refer to the installation guide. In order to use Watcher, you have to configure your credentials suitable for watcher command-line tools. You can interact with Watcher either by using our dedicated Watcher CLI named watcher, or by using the OpenStack CLI openstack. If you want to deploy Watcher in Horizon, please refer to the Watcher Horizon plugin installation guide. We can see all of the commands available with Watcher CLI by running the watcher binary without options. If you get “You must provide a username via either –os-username or via env[OS_USERNAME]” you may have to verify your credentials. Then, you can create an audit template. 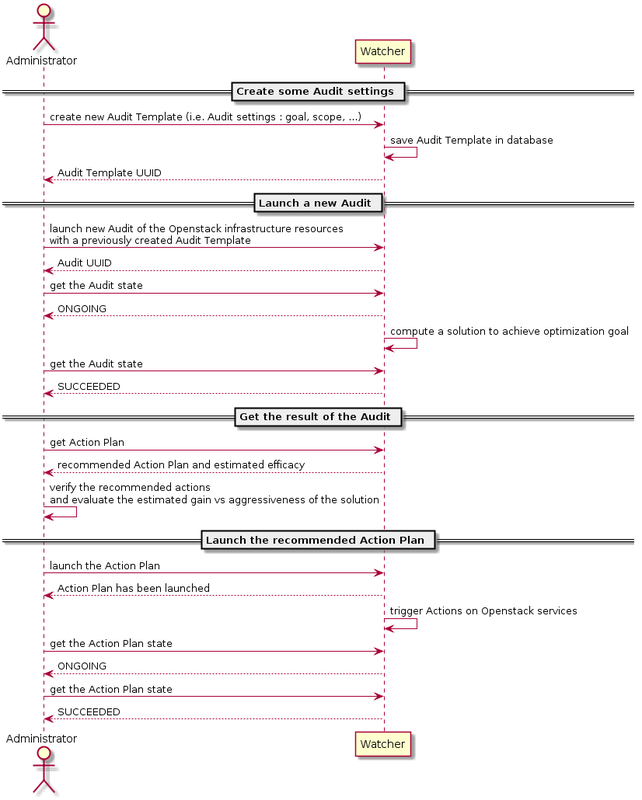 An audit template defines an optimization goal to achieve (i.e. the settings of your audit). Then, you can create an audit. An audit is a request for optimizing your cluster depending on the specified goal. You can launch an audit on your cluster by referencing the audit template (i.e. the settings of your audit) that you want to use. Watcher service will compute an Action Plan composed of a list of potential optimization actions (instance migration, disabling of a compute node, …) according to the goal to achieve. Seeing what the Watcher CLI can do ? How do I run an audit of my cluster ?